Once in awhile, shards of brilliance appear on the cycling radar. Jack Thurston, from www.thebikeshow.net dropped us a line and brought our attention to a wonderful cycling club. Tweed.cc. "For today's cyclist, skin tight lycra may promise a reduction in wind resistance but also in decorum. A reflective yellow vest guarantees high visibility, but who would wish to be seen in such a garment? 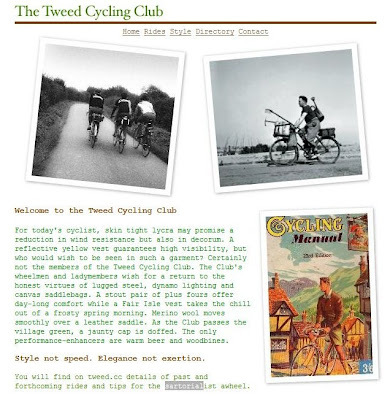 Certainly not the members of the Tweed Cycling Club. The Club's wheelmen and ladymembers wish for a return to the honest virtues of lugged steel, dynamo lighting and canvas saddlebags." "Why spend a king's ransom on the latest titanium confection when any weight advantage will be rendered irrelevant by a cheese-and-pickle sandwich and thermos of soup?" Indeed. These cyclo-sartorialists speak our language. In a way they are the cycling version of the Slow Food movement. We wish them well on their slow-paced, 'let's-stop-for-a-shandy-and-a-ciggie-shall-we' journey through the cycling landscape. Have a gander at their website. I have tried 4 times now to get this blog to accept my listing of the Gentleman Clyclist URL and hopefully if I cut enough of the "common" URL things like the h_ _ p and the "w_w" stuff the URL will get through and still be recognizable to a human wanting to check out the web site. Good, I see that the 5th time it went thru. Please note that one must precede the "3" with the ususl "www". The website is classic. Love the writing. thanks for the link anonymous... we'll be sure to get a post written about 3speedtour.com!